The Tees Transporter Bridge has been a symbol of the area since it was opened in 1911. 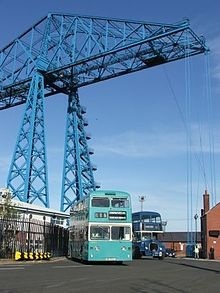 There are only two other Transporter Bridges still in existence in Britain. These bridges are at Newport (Gwent), opened 1906 and Warrington, opened 1916. The Tees Transporter is a total of 851 feet (259.3 metres) in length which makes it the longest of those remaining Transporter Bridges in the world. Its cantilever construction has three main bridge spans that give it its unique appearance. The bridge is, effectively, two almost independent structures joined at the centre of the River Tees. Each half of the bridge has an 'anchor' span of 140 feet (42.6 metres) and then cantilevers across the river some 285 feet (86.8 metres) from the tower leg to meet its twin from the opposite bank. The passenger gondola is suspended by steel cables and runs on a wheel and rail system approximately 160 feet (48.7 metres) above the River Tees. While Middlesbrough's Transporter is the largest operational Transporter Bridge the largest bridge ever of this type is recorded as 1000 feet (304.7 metres) in length, built over the River Mersey near Widnes [details here]. That bridge closed in 1961 and has, sadly, now been demolished. As far as we have been able to research, there have been some twenty Transporter Bridges constructed around the world of which only eleven still exist and a lesser number again are still in regular use. The first bridge, near Bilbao, Spain, opened in 1893. All the bridges were constructed in the 23 years between 1893 and 1916 and of the nine demolished structures an average life of 36 years was achieved. The Tees Transporter Bridge is fully operational and provides a regular quarter-hourly service between Middlesbrough and Port Clarence (Stockton on Tees ) for 12 hours a day. This service is interrupted from time to time for routine maintenance works, with some lengthier closures for major refurbishment. It remains the largest of the Transporter Bridges operating worldwide, and provides a valuable public transport service, crossing the river in two minutes. In December 1993, the bridge was awarded the Institution of Mechanical Engineers' highest honour, The Heritage Plaque for engineering excellence, in recognition of the Council's efforts in keeping the bridge in good working order. Its historical importance was also recognised in 1985 by its listing as a Grade II* Listed Building and its prominence as a local landmark was further enhanced in 1993 by the installation of flood lights that operate during the winter months. In recent years despite all the efforts of the cast of Auf Wiedersehen Pet, the bridge still remains the focal point of the River Tees. The TV show, which became an instant hit, showed the Transporter being disassembled and sent to Arizona in America. The people behind the programme obviously did a very good job on the computers as many Teessiders thought their beloved bridge was on its way across the Atlantic. However we won't be saying 'Auf Wiedersehen' to our bridge for a few more years yet.